Isaac lived in a less turbulent time than his father. The Canaanite Empire had solidified itself and the great, raging wars that had existed in Abraham’s time (Genesis 14) had ceased. Egypt was the sleeping giant. It was in the preliminary stages of becoming the dominant Empire we know it to be, but its influence did not yet significantly impact upon the people north of the buffer zone known as the Sinai desert. Much of the relative peace can be attributed to the destruction of Sodom and Gemorrah, which were powerful city-states who served as a counter to the Canaanites. Their destruction opened the path for Canaanite consolidation of power, militarily and economically. There was less reason and opportunity for war. Therefore, Isaac grew up in time of relative stability. However, he remains a most enigmatic figure. The Bible itself spends a great deal of space on Abraham and Jacob, but relatively little on Isaac. And what is said is mostly said in the context of his relationship to his father, Abraham, or is sons, Esau and Jacob. Isaac serves as the transitional bridge from his father Abraham to his son Jacob, but is the most mysterious of the three forefathers. All the forefathers lived lives indicative of what would happen to the Jewish people, but in many ways Isaac foreshadowed Jewish history more than the others. For example, the Bible says that he came to a strange country in a time of drought and began digging wells (Genesis 26). Water was the most precious of all commodities. When Isaac found water he brought prosperity to himself and the land. And, yet, the Philistines stopped up his well and each of the subsequent ones.1 Abimelech, the Philistine king, even told Isaac to leave. “Be thankful that we are letting you leave with your life,” the Philistine told him. “You became wealthy from us” (Genesis 26:16). It is our money you have taken, he implied. Isaac possessed the opposite personality of his father. Abraham went out and brought countless strangers to belief in monotheism. During Isaac’s time there was a slow erosion of followers and the monotheistic ideal, in general. People who had been loyal to the ideals of Abraham died and did not pass their loyalty onwards. Whereas Abraham was expansive Isaac was conservative. When confronted with opposition father and son reacted very differently. When the Philistines took Abraham’s wells he told the Abimelech that he was a thief (Genesis 21:25). Isaac, by contrast, did not tell off Abimelech. Rather, after they stopped up the first well he moved away. After they stopped up the second well he moved away again. Isaac is the placid, long-suffering Jew, who is not necessarily going to stand up for his rights. He prefers a very low profile. He is not looking for a fight – even when he is in the right. Even when he knows that he has the promise of God that He will protect him! He is not interested in confrontation. That is not a very heroic pose. No one in Hollywood will make a movie about someone like that. Yet, Isaac’s personality has advantages. He is the “survivor” in Jewish life. His defining moment is the Akeidah (the “Binding of Isaac”) when he was bound to the altar to be a sacrifice (Genesis 22), an event which haunts him every moment of his entire life. People who went through the Holocaust lived with the trauma their entire lives – even if they made something of their lives and had many children and grandchildren. Psychology majors have developed theses on them; how the psychological makeup and behavior patterns of even the children and grandchildren of Holocaust survivors are unique. It must be. The trauma of being on the Akeidah is not something that can ever be forgotten. And that colors the behavior of Isaac in general; for example, his passivity. Nothing fazes him. He stays calm – too calm for many people – in every situation. He possesses equanimity, a cool faith that is a rock to some and unnerving to others. The rabbis say that the origin of Isaac’s blindness occurred at the Akeidah. As he lay on the altar the tears of the angels fell in his eyes. He saw their trauma, so to speak, which was a reflection of his own. The Akeidah was a defining moment for him, the formative experience of his formative years. This colors all of his life; it influences all of his decisions, and makes everything he does more understandable to us. Isaac’s blindness is, of course, more than just physical. The Talmud says that just as hatred destroys all objectivity so can love. One has to be objective even regarding one’s children. Esau ends up guilty of all the cardinal sins: murder, idolatry and adultery. Yet, Isaac remains blind to them. He does not want to know. In truth, Esau was a person of enormous potential and great talent. Imagine a Napoleon, Alexander the Great or Julius Caesar… as an observant Jew! Esau could have been that person. That was what Isaac was hoping for. Rebecca, who came from the house of Laban, the crook, knew what degenerate people looked like. She saw that in her own house. She knew that there came a point of no return with a personality like her son Esau. So she was not fooled by him. She was not blinded… unlike her husband. Because of his blindness, Isaac unwittingly gave the blessings for material well-being to Jacob, not Esau. When Esau entered right after Jacob departed and Isaac realized the mistake, “He trembled greatly” (Genesis 27:33). He was terrified. There is a traditional source that says he was more frightened than the time when he was on the altar. The rabbis say further that when Esau came into the room Isaac smelled the smell of Gehinnom (the Jewish name for Purgatory or Hell). Jacob, who was wearing goat skins which is about as offensive a smell as there is, smelled like the “Garden of Eden” (i.e. 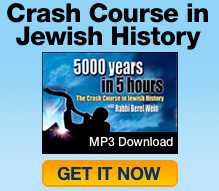 Heaven), the rabbis say. These were not physical smells. Rather it was the inner fragrance they gave off; their inner worth. No amount of cologne could mask the inner, moral stench that was Esau. That was the “terror” that Isaac felt. He finally understood who Esau was. Reality hit him and it was more frightening than what happened to him at the Akeidah. He saw the cruelty. He saw the murders. He saw the wars, the crusades, the pogroms, the holocausts Esau would commit. And that appalled Isaac. How could that be part of his son? He had blinded himself to the possibility. Now the truth was finally revealed. It was the hardest reality to swallow. His son Esau was to be excluded from the Jewish people. As painful as that is, it has repeated itself in Jewish history. That is the pattern. The Holocaust itself reduced the Jewish population by about a third. However, beyond physical persecution is the attrition of numbers due to assimilation. A person can come from the house of Isaac and Rebecca, yet end up with no connection. Most of people from Spain today are descended from such people. There is Jewish blood in almost every Spaniard if you go back far enough. And that is just one example. When Isaac realized that – “A great terror came upon him.” This was his lot in life. It was the result of his personality and experiences. And it serves as a particularly poignant lesson to us. Among all of the forefathers he is, arguably, the one who most represents the pattern of all future Jewish history. Understanding the life of Isaac is to understand where the Jewish people have been and where their destiny points to in the future. In 1967, there was a warehouse in East Jerusalem filled with cases polio vaccine. On the boxes it said, “A gift from the people of the United States.” It was donated to Jordan. However, the Jordanians did not use it even though polio existed and there even was an epidemic there two years before. The reason they refused it was because the man who discovered it, Jonas Salk, was a Jew. Better that Jordanian children should have polio than admit that they benefitted from Jews, the Zionist enemy. So, too, the Philistines with the water. Better to have drought than “Jewish” water, they said.